Last weekend the GTronix 360 ° Team Mcchip-dkr started the 7th round of the VLN at the Nürburgring. The Renault R.S. 01 was driven by Heiko Hammel, Dieter Schmidtmann and Felipe Laser, like in VLN 6. But this time with the tire partner Yokohama. Already in the qualification on Saturday morning, Felipe Laser sent out a clear sign with a lap time of 7: 58.833 and starting position No. 2. Everything seemed promising In the race. But in Round 8, some frightening seconds followed: We were hit by a tire blow-out in the “Galgenkopf” section. 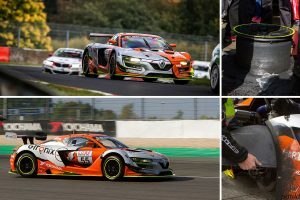 Fortunately, Heiko Hammel was able to keep the Renault RS 01 on track and came back into pits by oneself, and a time loss of almost 1:40 minutes. The damage to the diffuser and bodywork was not that significant. So, the Renault was on track, attacking again, after a short time. Unfortunately, we lost the overall second position by this maneuver. In the end, the Renault drove past a podium spot, with a gap of 28 seconds. It was not the big win, but a considerable team effort to finish the 2017 season satisfactorily. Whether we are back in the VLN long-distance championship with our Renault RS 01 GT3 project “Chappie” in 2018 is uncertain at present. We would like to thank all involved for the great work! Huge thanks to the numerous fans who were able to surprise us with their unreserved interest. We had never expected such enthusiasm at the beginning of the year. Thanks to our partners KW Automotive and H&R Federn, who supported us from the first day of the project at any time.